We are in a pre-launch mode in advancing the conversation of Jesus. 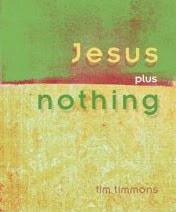 At www.timtimmons.com we are releasing a new library of books, study guides, discipleship talking points, audio and video series, and daily podcast/blogs. After being taught and teaching otherwise, I've come to the conclusion that God never intends to take those who respond to him out of here. Even with Jesus' teachings about his return and the end of the world, he has not given us a way to get out of here. That's not the direction! God is doing all he can to get down here-to dwell among us. So this is what God has been up to ever since the human race lost the Kingdom, the personal relationship, and the abiding presence of God. Through the priests, the judges, the kings, and the prophets, God wanted to dwell among those who would trust him, and those people would be a blessing to all the nations of the world. After the prophets, there was a period of four hundred silent years. It was at this point that Jesus was sent to earth. His mission was to reveal the good news of the Kingdom and, by doing this, to restore what humankind had lost. Jesus repeatedly announced the Kingdom, he established the possibility of personal relationship with God, and he introduced the abiding presence of God for all to experience. He did all this down here-on earth. Jesus brought the Kingdom of God to earth, because he is the King. Wherever the King is, there is the Kingdom. He was the dwelling place of God on earth, fully indwelt with the Spirit of God. God had finally come down here to dwell among those who would trust him. The primary activity Jesus wants his followers to focus on is to make disciples of all the nations-to invite, enroll, and encourage people from all of the nations to be followers of Jesus. Note what Jesus does not say here. He does not say to convert people from around the world to Christianity. He does not say to save the people of the world from hell and damnation. He does not say to offer the people of the world a ticket to get out of here with a ticket to heaven. It is clear that Jesus is commanding his disciples to disciple the nations of the world-to make followers of Jesus around the world. Note that this is to be done right here, right now, on earth. To give his disciples the authority and power to do such a thing, Jesus says, "All authority has been given to Me in heaven and on earth." Jesus claims that he has complete authority over heaven and earth. How much? Jesus says, "All!" Now, since Jesus has all authority and we are followers of Jesus, we are able to operate within his authority. You see, Jesus is the King of the Kingdom we are seeking. Jesus goes a little further to encourage us as followers. He says, "I am with you always, even to the end of the age." So, while we, as his followers, are inviting others to become followers of Jesus, he, the one with all authority and power will be right here with us! He's not saying that he, from his heavenly position, will pray for us to do well. He is promising to be with us as we make disciples (followers) right here on earth. Note that Jesus is also not urging his followers to be looking and praying for his return in order to get bailed out of this earthly mess. On the contrary, he is urging his followers to be about the activity of introducing and inviting people everywhere into a relationship with Jesus, so they can be followers of Jesus, too. Where? Right here on earth! Now, if Jesus is all about the making of disciples down here on earth, then in what context might we find the people we are to disciple? Do we have to become professional clergy to reach the non-religious? Do we have to become missionaries to go to foreign lands? If the making of disciples (followers) of Jesus were limited to the professionals, then not many disciples will be made. In the mind and teaching of Jesus there are no professional clergy versus the laity in the Kingdom of God. All are equally responsible to walk with Jesus, to walk with other followers of Jesus, and to wait on Jesus to lead out. There is no professional disciple-maker. All of Jesus' followers are to make disciples of all the nations. At times, Paul was a good example of this kind of thinking. Paul had a job that paid the bills. He was a tent-maker. He worked this job in order to be free to make disciples of all nations. Paul met a couple of other people in his profession. Check it out: After these things he left Athens and went to Corinth. And he found a Jew named Aquila, a native of Pontus, having recently come from Italy with his wife Priscilla, because Claudius had commanded all the Jews to leave Rome. He came to them, and because he was of the same trade, he stayed with them and they were working, for by trade they were tent-makers. And he was reasoning in the synagogue every Sabbath and trying to persuade Jews and Greeks. Now, most of you have jobs or a profession-a way to make enough money to pay the bills. No matter what job you perform, that is considered a tent-maker job in the Kingdom of God. Some business or someone is paying you to do a certain job for them. In the Kingdom state of mind, you are to do this work as best you can. This job allows you to connect with others (colleagues, managers, and customers) and provides a platform for you to make disciples (followers) of Jesus. It allows you the opportunity to be Jesus in the marketplace. This is the context of the world, within which Jesus has placed you to be his presence-to be salt and light. When a follower of Jesus gets this concept, he or she becomes a Kingdom man or a Kingdom woman-one who is living with a higher calling than just performing a job. The Kingdom man/woman is not at this position to preach or to demonstrate for Jesus, but to be a demonstration of the love and life of Jesus in touching others in the marketplace. This is truly the Kingdom state of mind at its best! This is the best position to be held on planet earth! Jesus' primary teaching was the good news of the Kingdom. His challenge was to "Follow me!" and as people began to follow, the Jesus movement was launched. The purpose of the movement is to do one of the most difficult things ever-to introduce Jesus to the world by demonstrating him to the world, by walking, talking, thinking, and loving like Jesus. You see, Jesus doesn't want you to demonstrate for him, but to be a demonstration of him-of his love and his peace. Jesus launched a revolutionary movement. Are you participating in this movement-the orbiting (little-c) church movement Jesus founded-or are you still only a spectator in a big-C Church? You can do both and gain much out of your experience, but don't miss out on making the Jesus movement your priority right where you live. Jesus is already moving in the world around you. He's looking for you to join him there. This is what the Kingdom is all about. One couple with whom we walk has set up a study/fellowship evening at their home every Tuesday night. They have become convinced the most important aspect of this little gathering is that they are consistently there, no matter what, every Tuesday night. People come and go, but they know this home is open and welcoming to them on any Tuesday night. There's something refreshing in our world about consistency. Another couple has spent their time and energy following Jesus' commandment of loving your neighbor as yourself. They have taken this neighborhood love to a whole new level. They don't preach to their neighbors. They don't invite them to a Church. They don't get caught up in the divisive gossip of the neighborhood. They do something entirely different. They have determined to be Jesus to their neighbors-live, think, love, listen, and talk like Jesus to their neighbors. They have become loving neighbors in their community, and the members of this community are responding in positive ways. They listen to problems and concerns. They laugh with their neighbors and cry with them. In some ways, according to a Jesus standard, they act normally in their neighborhood with a lot of authentic, nonjudgmental love. We desperately need more "normal" neighbors, living life in the love of Jesus. This is what the Jesus movement is to be about. This is Kingdom living at its best! The Jesus movement that orbits around the organized religious institutions and the community is not made up only of Christians. The Jesus movement includes a vast variety of people from all kinds of cultural backgrounds. What holds this movement together is that each person, no matter his or her religious background, is a follower of Jesus. Each follower is walking through life with a Kingdom state of mind. In the well-known Garden of Eden story, Adam and Eve enjoyed the presence of God. They were all set-good jobs, lush place to live, great retirement benefits, and a personal relationship with God. They were to fulfill three purposes: * Together they were to reflect the image of the Creator God. * They were to reproduce that image by filling the earth with children. * They were to reign together against evil to cultivate and guard the garden as co-rulers with God. Both Eve and Adam made a fatal mistake, not only in failing God, but also in failing each other. They had only one prohibition that was set up by God. However one wants to characterize that prohibition and the subsequent encounter with the serpent that lured them into breaking the universal law set up by their Creator, they blew it! They blew it by not trusting their Creator God and by disobeying what he said. * They lost the Kingdom where they were co-rulers with their Creator. * They lost the personal relationship with the Creator God. * They lost the abiding presence of God's Spirit. Ever since those losses, humankind has been desperately trying to recover. Every religion, philosophy, and political ideology is an attempt to fill that hole in the soul, where there is a deep yearning for fulfillment and joy. Each is an attempt to seek the Kingdom that was lost in the Garden, to seek to reestablish a personal relationship with the Creator, and to seek to restore the abiding presence of God. Most every religion sets up a system (and often an obstacle course to make your way through) in order to get out of this painful place and get to Heaven, Nirvana, Eden, Shangri-La, Paradise, or the Promised Land. Every religious system is a well-meaning attempt with its own desires and standards. Christians are trying to be the best Christians, Buddhists the best Buddhists, and so on with Hindus, Muslims, Jews, and animists. Since God created all peoples and is holding them together, eternity has been placed in everyone's heart. This is why people worldwide search for God. At the core of the search is this deep ache from the hole in the soul. Everyone is seeking the Kingdom, seeking that personal relationship with the Creator God, and seeking an abiding presence with God as in the beginning in the Garden of Eden. But setting up ways to get out of here isn't the way of God; it's the way of humankind. Nor is it God's way to set up a system of dos and don'ts to avoid going to hell. It's interesting to note that there was no system set up in the Garden of Eden and no worship, but only a relationship with the Creator God, walking together in the Garden. This is why, after establishing a massive system of sacrifices and feasts, God says through the prophets, "I want compassion rather than your sacrifices." God wants a relationship. There is a simple distinction made between religion and relationship. Religion is humanity's best attempt to avoid going to hell. Relationship says, "I've already been to hell and don't want to go back!" A personal relationship with Jesus and his movement is living in the Kingdom right here right now! I want to revisit the words of Jesus as recorded by Matthew and Luke and unpack the two universal problems you can get rid of, as you seek after the Kingdom of God. NOTE there are two ways of living your life. Let's designate these two ways as earthly-the way the rest of the world lives-and heavenly-the way Jesus urges his followers to live. You could say the earthly way is the kingdom of man on earth and the heavenly way is the way of the Kingdom of God. Jesus clearly describes the earthly kingdom of man as being filled with two dynamics. One-the nations of the world without faith eagerly seek after temporal things, such as eating, drinking, and clothing. Two-they continually worry about what they will eat, what they will drink and what they will wear. The earthly kingdom of man focuses itself on this kind of stressing out; they spend their time worrying! Essentially, this is worrying about your life, literally your life's breath. The Kingdom of God people of faith are given three instructions. One-know that God knows your needs and wants, so don't spend your time worrying about these things. Two-keep on seeking after the Kingdom of God and God will add these temporal things to your life. Three-don't worry about tomorrow either. So, do you tend to spend your time worrying about the temporal things of life or about what's going to happen in your future? Jesus gives you the two step answer to your worries right here. Step #1-"Stop your worrying, because God cares more than you do about your needs!" Step #2-"Spend your time seeking after the Kingdom!" Focus your life and time on what it means for you to trust in Jesus enough to follow him. Focus your life and time on getting into that Kingdom state of mind we discussed yesterday. Look for the divine appointments God is setting up for you each day and do your best to show up! There is a watching, waiting and worn-out world around you. They are in desperate need of answers and solutions that only Jesus can give them. So, if you want to follow Jesus more closely and experience the Kingdom state of mind, (1) stop spending your time worrying about things the rest of the world is worrying about. (2) Keep on seeking after the Kingdom 24/7. Jesus repeats the same theme by saying, "Do not keep on worrying." Then, Jesus warns of another problem that goes along with worry-FEAR. Jesus says, "Do not be afraid, little flock, for your Father has chosen gladly to give you the kingdom." Worry and fear are destructive bedfellows. Fear is the opposite of everything you are in your Creator, and therefore it has a negative effect on your mental and physical health. Fear is worry magnified. My dad used to say to me, "There's no use putting up your umbrella, until it rains." I've also advised my friends, "Wait to worry!" Most things we worry about never, ever happen! If you find yourself eagerly holding on to either or both of these, you are living an earthly life without the benefit of God and His Kingdom. Jesus prayed, "May your Kingdom come on earth as it is in heaven." Jesus' answer to your worries and fears is: That's no way to live, so stop it and seek after the Kingdom state of mind. Even though we have wonderful beaches and terrific weather throughout the year in California, many of us get away from it all by going to one of the Hawaiian Islands. I'll never forget our first trip there. We were greeted at the airport with an immediate tropical breeze, our hosts placed a flowered lei around each of our necks, and all the way to the hotel we were told that Hawaii is the most beautiful place on earth-a place to become "unbuttoned" and hang loose. The entire experience was an Aloha state of mind! My son-in-law and colleague, Jason, shared with me this week that this is precisely how we are to view the Kingdom. Instead of an Aloha state of mind, seeking the Kingdom can be the Kingdom state of mind. I love it! What does it mean to have a Kingdom state of mind-to live the Kingdom lifestyle right here, right now? I can think of 5 descriptors. FIRST-In the Kingdom state of mind, you are not in control; Jesus is. When you enter the Kingdom of God, you sign over your personal kingdom to Jesus. You look to Jesus first for direction-for orders and opportunities. He's in charge and you are not! SECOND-In the Kingdom state of mind, you are aware that Jesus (your new King) is actively at work all around you. He is not only working in and through you, Jesus is working with every person all around you. You see, Jesus is more concerned about you and the people around you than you are. THIRD-In the Kingdom state of mind, you know Jesus wants you to re-present him to whomever you meet and wherever you go. This, in itself, is a revolutionary thought. This is why Jesus says to his early disciples: "You are the salt of the earth. You are the light of the world." In the Kingdom state of mind, your very presence in a room is the presence of Jesus in that same room. People will sense it. Your touch will be the touch of Jesus. In the Kingdom state of mind, your light will shine as Jesus and people will be attracted to you. Your light counteracts the darkness in people's hearts and minds. People will be able to see Jesus in you! FOUR-In the Kingdom state of mind, you don't have to go find people to help. People in need will either be sent to you or people will be brought up in your mind. All day long Jesus is setting up "divine appointments" for you. He is setting them up and is awaiting for you to show up. FIVE-In the Kingdom state of mind, you know the world around you is watching, waiting, and worn-out. There is a watching world. They are keen to observe your lifestyle-your relationships, values and decisions. They are keen to watch how you love others or if you do. They are also watching what you do, when you are cursed by others. Will you come back with a curse or will you give a blessing instead? In the Kingdom state of mind, you look for opportunities to be a blessing-to do good for another, to affirm others, and to speak well of others-wherever you go. In the Kingdom state of mind, you are to be bent on being a good-finder-an agent of Good News-a personal agent of Jesus! There is a waiting world all around you-waiting for their prayers to be answered-waiting for someone to care enough to come alongside to help them or comfort them or love them. In the Kingdom state of mind, you are the possible answer to their prayers. There is also a worn-out world. These are the disenfranchised-the marginalized. They have given up on their dreams. These are the hopeless and maybe even homeless of our world. In the Kingdom state of mind, these are the very special people who are on the heart of Jesus. I could go on and on describing the Kingdom state of mind. And, so can you! Do you see how the presence of the Kingdom right here right now is not only good news; it's the best news anyone can experience or spread. This is why Jesus' first words were announcing the presence of the Kingdom. This is why most of what Jesus taught was about the Kingdom. His teachings weren't about a list of do's and don'ts or a performance system, whereby you can accumulate points to impress God. Jesus taught that anyone can live in the Kingdom state of mind. This is why Jesus says the Father has chosen to gladly give you, a Jesus follower, the Kingdom (Luke 12). This is why when Jesus began speaking in parables in Matthew 13, he said that "the knowledge of the secrets of the Kingdom is given to those" who have ears to hear and eyes to see. I don't know what you're thinking, but I really want to be in the Kingdom state of mind every day possible. I love the Aloha state of mind, for sure, but I'm sticking with the Kingdom. I know this. If I seek first his Kingdom, I can experience Jesus, in the Kingdom state of mind.